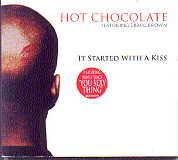 Its been some time since I have had the opportunity to back announce Hot Chocolate - It Started With A Kiss. This was a record I remember we, at Radio Senicland in Greymouth, wore out the beginning of from lots of playing and cueing up (where with a vertical pick-up you turn the 45rpm record back and forth until you find the start point, back track just a little, so that when you release the spindle lock the record is up to speed on the turntable by the time the needle connects with the start of the song.) This Hot Chocolate song got worn out and we had to seek a replacement from the record company. l guess this says that I've been on radio formats that don't play such material until I got involved with this station down country shortly after we set up my Unforgettable Music format to broadcast out of Warren Flaunty's building in Don Buck Road. This came about through an offer from Warren to the Massey Matters team that he would facilitate such an arrangement with a special rental agreement. The first Massey Matters Co-ordinator Fran got into gear and with the right contacts helped pull all the necessary funding and logistic requirements together to make it happen. So the Massey Matters Office is up and running around the back and below the Massey Pharmacy in Don Buck Road. So do pop in and see the team of Linda, Sue and Jen and they might let you lift the table cloth and reveal the computer running the programme under the table in the corner. Phone the office on 832 0431. Thanks to Jim Wolf of the Unforgettable Music Society, who did the cleaning of seagull matter with the seat of his pants, sliding along Warren's roof ridge line to install the antenna and run the coax cable down into the office. With my broadcasting into Taupo, via the internet from my home in Sunnyvale Road, I have been kept quite busy so that I haven't really had a chance to push along the next phase of the trial of running Unforgettable Music as a Community Station for Massey. While I do a show into Taupo from 6 to 10am, I just let Massey radio run on its on, but playing the same music (and hourly playlist) that goes out down the line (where I can't actually hear that programme), so Massey enables me to monitor the flow of music and general sound. Although I did experiment with adding a variation of the same announcements I did for Taupo into the programme running out of Massey 6 to 7am Wednesday 29th and Thursday 30th July. Did anyone notice? For our next phase of Unforgettable Music Massey, I need to find the time to guide our best funding secretary to chase up support to have a repeating transmitter at either Royal Road (to reach Luckens Road perhaps) or at the Massey High School (to reach into Ranui). I believe there is some synergy between Ranui and Massey, so having a radio station linking the two would be quite useful. Should these repeater trials prove successful, the other option, as I see it, is to have another Low Power FM station aiming at the younger end of the Massey population. Then we would need more volunteers to prepare and present programmes. I have heard from people willing to help, and hopefully their names are in a 'safe place' that I can recall when I need it. It is not just voices on air I need assistance on but people with an eye for detail to coordinate the requests for Community Notices and the like. It would be nice to also find researchers to help fine 'identities' to interview for oral history archive purposes and to run extracts on Unforgettable Music Massey. Now I have to find time (inclination and energy TIE) to sort out some Forgotten Singles for the month of August to play on Coast. I search through my Million Sellers and No 1 Hits files from 1955 to end of the Seventies.